Measuring Ocean Currents: Tools, Technologies, and Data covers all major aspects of ocean current measurements in view of the implications of ocean currents on changing climate, increasing pollution levels, and offshore engineering activities. Although more than 70% of the Earth is covered by ocean, there is limited information on the countless fine- to large-scale water motions taking place within them. This book fills that information gap as the first work that summarizes the state-of-the-art methods and instruments used for surface, subsurface, and abyssal ocean current measurements. Readers of this book will find a wealth of information on Lagrangian measurements, horizontal mapping, imaging, Eulerian measurements, and vertical profiling techniques. 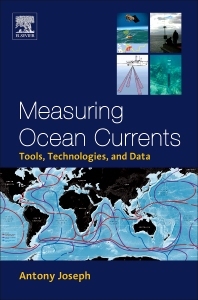 In addition, the book describes modern technologies for remote measurement of ocean currents and their signatures, including HF Doppler radar systems, satellite-borne sensors, ocean acoustic tomography, and more. Crucial aspects of ocean currents are described in detail as well, including dispersion of effluents discharged into the sea and transport of beneficial materials—as well as environmentally hazardous materials—from one region to another. The book highlights several important practical applications, showing how measurements relate to climate change and pollution levels, how they affect coastal and offshore engineering activities, and how they can aid in tsunami detection. Antony Joseph has an oceanographic career of about 36 years. He has worked at POL (UK), where part of his Ph.D work was carried out. He lead the establishment of a sea-level station at the central east Atlantic coast, the data from which, in the absence of other data from this region, became highly valuable in understanding the global extent of the December 2004 global tsunami. His contribution enables real-time Internet viewing of data in graphical format (http://inet.nio.org). He authored two Elsevier books: (1) Tsunamis, (2) Measuring Ocean Currents; published chapters in books, articles in Encyclopedias, research papers in journals; and interacted with the public through print and audiovisual communication medias.